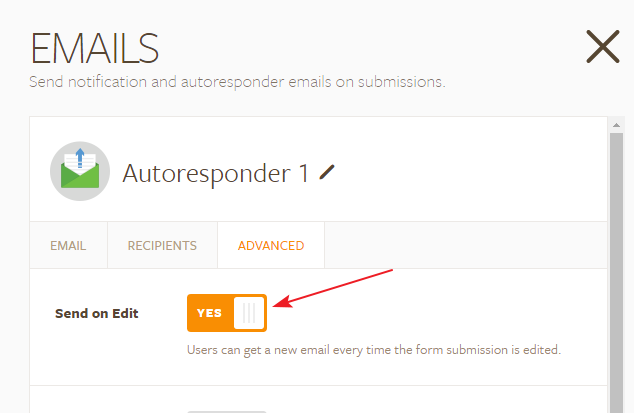 How do I resend an autoresponder after editing a form submission? I echo this request but it would be nice to have a way to have certain edits trigger a resend (in the conditions). Most of my edits are to the email section because they are entered incorrectly and the auto-responder email is never received. I also have certain hidden fields that I use for administrative purposes and I don't want to trigger an auto-responder email when I complete them. Is there a way I can save without submitting the form? I have not yet found a way to do this but would appreciate any help. I have checked your account and there are no forms available in your account. Are you a sub-account user for any other account? If you do not want to send the auto-responder after submitting the form, you may add a condition based on the hidden fields using Change Email recipient option in the conditions wizard. When a condition is added to a notification/autoresponder, the email will not be sent unless the condition set is true. Hope this information helps! If you need any further assistance, please get back to us with the form ID that you are working so that we can guide you in the right direction. Somehow, your response to the post is not updated on this thread. However, I've received an email with the following response. Thank you for your answer. I am a sub-account user and all of the forms I created belong to the account I am under. I toggled the Send on Edit button which works well with my various test attempts and am testing out the conditions. Glad to see the option "Send on Edit" worked for you. Please check with the conditions and let us know if you need any further assistance.